Hello, I'm Gregor and I put this site together. At first, you'll find an overview of recommended 5.1 receivers, followed by a public poll and a general buying guide on 5.1 receiver. Further down on this page, we do link to other well-written articles and reviews about 5.1 receivers. At last, you'll be able to weight in your own opinion in the comments section. If you also want to vote on the best 5.1 receiver, click here to view the poll. 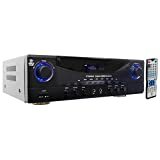 It's easy to get confused or overwhelmed when shopping for an AV receiver, especially if you don't have much technical knowledge of home theater equipment. There are many leading brands offering proprietary features, and it's not always clear whether you really need those features or not. You definitely want to invest in a high-quality receiver that contributes to exceptional sound quality, but you don't want to overpay for unnecessary features. This 5.1 receiver buying guide will help you cut through the madness to identify the features that really matter. Spend a couple minutes reading today so that you can enjoy your sound system for years to come. If you're setting up a new home theater or you just want to maximize the sound quality from your television, this is one of the biggest decisions you will make. An active sound bar is easy to install and start using right away while a receiver requires a bit more setup, especially if you're connecting surround sound speakers around the room. If your primary concern is ease of use, a sound bar may fit your needs. If your primary concern is stellar sound quality or you want to create a true theater-like experience, then a quality receiver with surround sound speakers is essential. Many people start with sound bars and then upgrade to receivers when they want to take their sound quality to the next level, but you may want to start with the receiver and get the ultimate set up right from the start. You also have the option of using a sound bar that connects to a receiver. The sound bar replaces the surround sound speakers, so your system is still easy to use and relatively easy to set up while benefiting from the power of a receiver. Sound bars just can't compete with the sound quality delivered by surround sound speakers positioned around the room. 5.1 Receiver vs. 7.1 Receiver – What Do You Really Need? If a 5.1 receiver is great, a 7.1 receiver is even better, right? If a 7.1 receiver is better, why not go for a receiver with 11 channels? The "bigger is better" mentality gets the best of many buyers, but this is one case where you may not need to pay for the maximum channels. Most soundtracks work great on a 5-channel setup today, and there aren't many that require seven or more channels. This makes the 5.1 receiver the most affordable and reasonable purchase for many buyers. This is a controversial topic, and you will hear conflicting opinions from different professionals. Some say look to the future and invest in at least seven channels, especially if you're connecting a surround sound system. Others reason that there aren't many 7-channel soundtracks out there right now, so why invest in a larger receiver? How much power do your speakers need? Surround sound speakers require more juice than stereo speakers. A 5.1 receiver is adequate for a basic surround sound system, and it's the ideal option for stereo speakers. 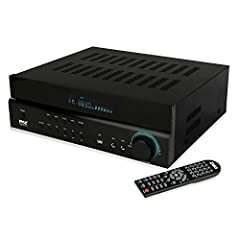 If you intend to upgrade to more powerful surround sound speakers in the near future, investing in a 7.1 receiver now may save you from upgrading the receiver along with the speakers. Advanced surround sound systems like Dolby Atmos require at least seven channels. 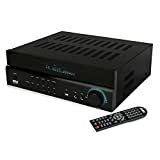 Do you intend to connect speakers from other rooms of your home into this receiver? The more connections you want to make, the more channels you may need. 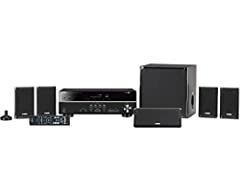 If playing music and other audio files in multiple rooms of your home while playing off one receiver sounds attractive, then you might consider a 7.1 receiver or larger. This is especially true if you're running a surround sound system in one room because that requires multiple speaker connections for that room alone. Can you afford a quality 7.1 receiver? They are more expensive, but they will give you greater versatility when expanding your sound system over time. 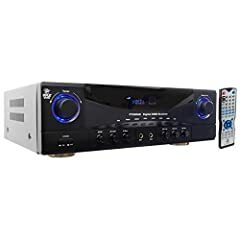 If you're more concerned about budget or you might want to upgrade your receiver in the future anyway, then a 5.1 receiver is likely your best option. Are you wondering about the sound quality difference between a 5.1 and 7.1 receiver? When you consider just the receiver, the difference isn't substantial. Your speakers have a much bigger impact on your sound quality, so a high-quality 5.1 receiver can deliver exceptional sound quality when paired with the right speakers. It's generally not worth upgrading to a 7.1 receiver for sound quality alone. Investing in better speakers would get you closer to your goal. HDMI Inputs – The more inputs the better. This allows you to connect elements of your sound system together without adding an HDMI switcher. Even if you don't have a lot of speakers or other elements to connect now, you never know what you may want to play with in the future. Make sure your receiver has at least three inputs, though six is ideal. Wireless Connectivity – Your receiver should have Bluetooth capability. This allows you to stream from a mobile device or computer. Multi-room audio and AirPlay are additional wireless features that you may consider, and some receivers are designed for direct connection to popular music services like Pandora. You will need Wi-Fi capability if you want to connect to the internet for even more functionality. 4K Compatibility – Even if you don't have a 4K television right now, you will likely find those sets attractive if you ever upgrade your screen. You can also stream in 4K now, so you want to make sure that your receiver can keep up with the evolution of technology. Your AV receiver should fit your budget as well as your entertainment goals. If you follow each section of this guide, you will have all the technical information needed to match your needs to the right receiver. Keep in mind that you're never stuck with your first receiver. You can always sell your unit to someone looking for a discount, freeing you to upgrade to something larger or perhaps a unit with more advanced features in the future. Who knows what technology will bring us for home entertainment in the future. If you just want to get a good surround sound system going in your home theater with the intention of upgrading to something better in the next couple years, a solid 5.1 receiver matched with quality speakers will do the trick without stressing your budget. New: Our editorial list of additional articles. 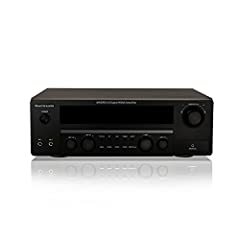 We decided to gather informartion all around the internet and present you a list of helpful, external links to interesting reads about the best 5.1 receivers and their reviews and guides. You're not convinced by the previous writings about 5.1 receivers? Of course you can just choose by visual impression, that's why we present you all our chosen products at a single glance. A click on any image is enough to open an external link to the best offer we could find. Finally, we want to present you our rating criteria for our 5.1 receiver comparison, so you can better understand and comprehend our recommendations and the rating process itself. Furthermore, we still ask you to keep your eyes open for short term deals in order to make some great bargains with 5.1 receiver in 2019. Published by G. Krambs on StrawPoll.com (last update on 2019-04-23 08:16:57). 17 of 22 readers found this article helpful.